ASDIP is a structural engineering software for the design of structural members based on the ASCE 7 load combinations. But what about if you don’t want your loads to be internally combined? This blog post discusses this important feature in ASDIP software. Structural engineering is all about calculations with loads, which are classified in different types, called Load Cases, such as Dead, Live, Snow, Wind, Seismic, etc. Typically the calculation results are generated and stored individually per each load case. These load case results are then affected by load factors in order to be combined between them per the Load Combinations. ASDIP uses the load combinations per ASCE 7-05 or 10. The image below shows the typical load cases for a spread footing subject to biaxial bending. Sometimes, however, there are situations where only a combined load is available, or where the load cases are simply not as important as the combined load itself. For example, the loads were already combined in your analysis software, and you want to use them as input in ASDIP. 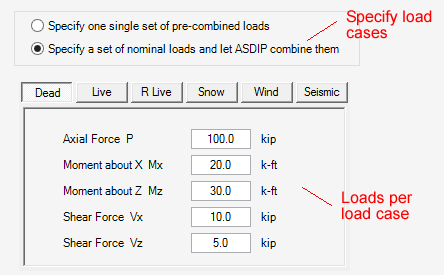 To handle this situation, ASDIP has a feature that lets you select a Pre-combined load, rather than a set of Load Cases to be combined internally, as shown below. In the example above, imagine that you are designing a spread footing and that you know the dead load, live load, etc. In this case it would be easier to specify the load cases and let ASDIP combine them internally. On the other hand, if you modeled your structure in your favorite analysis software, and you have the reactions already combined, then you can input these reactions as Pre-combined loads in ASDIP and design your footing accordingly. Note that the pre-combined loads for a footing include both service loads (to check the bearing pressures), and factored loads (for concrete design). 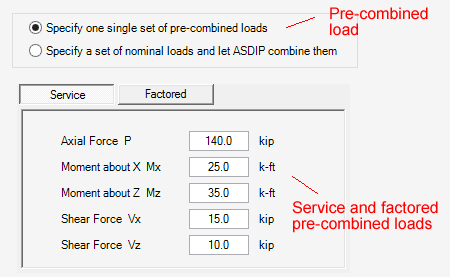 ASDIP has a feature called Pre-combined Load, which lets you input loads that were already combined somewhere else. This is useful when you want to run the software to check a particular set of loads without being modified by any load factors. Detailed information is available about this structural engineering software by visiting ASDIP. You are invited to download a Free 15-Day Software Trial or go ahead and Place Your Order.